Expecting Moms Oral Health “Teach and Talk”! CALLING ALL EXPECTING MOMMAS! 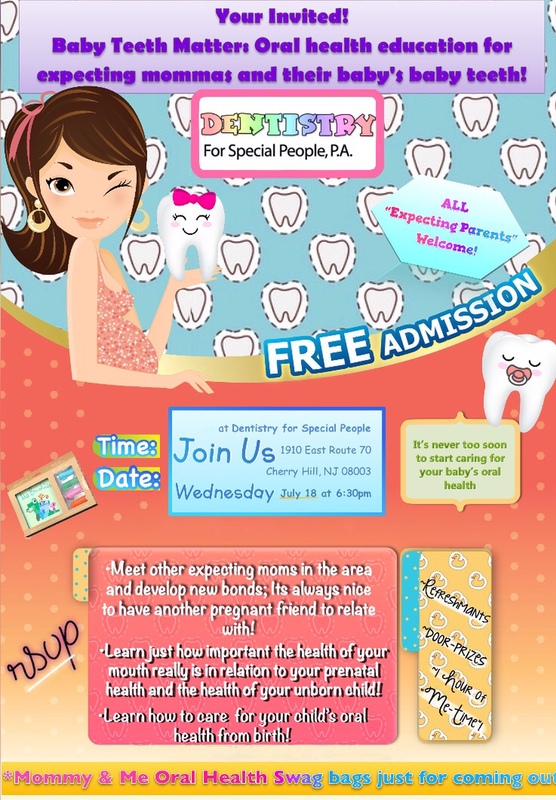 COME JOIN US on Wednesday July 18 for our very first “Expecting Moms “Meet and Learn” Class on the Importance of Oral Health: Both Momma’s oral health and your infants oral health! We all know that being pregnant has major effects on a mother's body, and your mouth is no exception! We also know that there’s a TON to think about when you're expecting a baby, and even more so once baby is born! TeamDfsp wants to help make sure that in the whirlwind of pregnancy and your child's birth, you remember about yours and baby's teeth! Because it’s never too late to start caring for your oral health, and it’s never too soon to start caring for your baby’s oral health!? So get ready for some learning, socializing, and super cool new baby swag to take home. And maybe the best part? A chance to meet other expecting moms in the community to bond, socialize, and swap pregnancy stories that only other expectant mommas can relate with! The class is being run by our very own, and very "expecting" hygienist Alexis! It is free, and the more the merrier! Please share with all your friends and any local pregnancy groups you belong to! We hope to see you there! *All expecting parents are welcome!